Polaris is a healthy company but has stumbled recently. Declining revenues caused the stock to drop by nearly 50%. Before investors jump in, quality control and inventory management issues must be resolved. Polaris (PII) is a pretty cool company that has become famous for off road vehicles and snowmobiles. 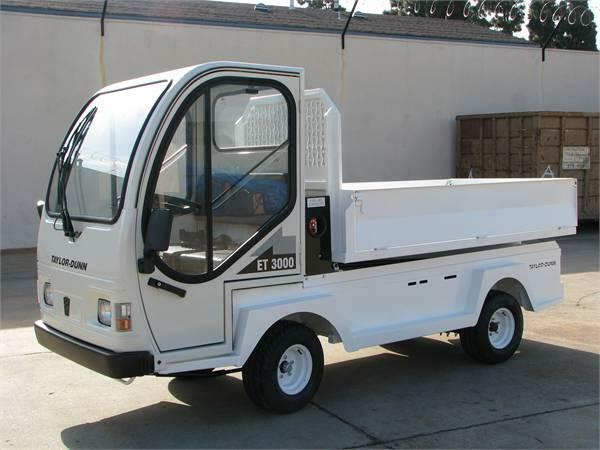 It has developed a commercial market and sell four-wheeled vehicles for rugged military use. The Slingshot, a sleek 3 wheel roadster, has garnered much enthusiasm and the Victory and Indian motorcycle brands have been immense sources of growth since 2011. The Medina, Minnesota company generated $4.7 billion in sales during 2015, with operating income of $716 million and earnings of $455 million ($6.75 per share). Operating margins have consistently pushed above 15%. The stock has recently traded around $83.50 per share. Polaris Industries receives many positive reviews on Seeking Alpha. Some of you may consider me a little late for the party. 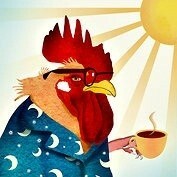 Rather than redundancy, I will strive to bring some context and color to the proceedings. As usual, my perspective is more bearish. I am not arguing for a share price decline, but my valuation only reaches $88. If you want some excitement about Polaris, Alpha Investments offers an excellent article which includes a summary of the company’s aggressive and successful expansion of Indian and Victory motorcycles. Growth in the segment is over 15% and the reviews are stellar. Unfortunately, management has acknowledged that 2016 revenues will decline by 2-3%. Gross margins will improve, but a lot of wind will be taken out of the sails by the effects of RZR recalls (explained below). Management expects earnings in the $6.50 range. The motorcycle segment has surged ahead, but sales are 19% of the overall picture at PII and they can’t completely compensate for ORV weakness. There are some recent developments at Polaris that require investors to trade carefully. 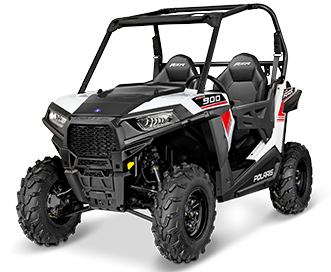 The RZR 900 White Lightning starts around $12,800 MSRP. While the recalls are not catastrophic, they will cost money and risk damage to the brand. On May 16, President and COO Bennett Morgan announced his retirement after nearly 30 years. Morgan is a major player and owns over 1% of the stock. CEO Scott Wine is going to absorb Morgan’s role. I am not aware of the circumstances of Mr. Morgan’s departure. He is in his early 50s, so we hope his health is not a problem. However, one is left to speculate that some dissatisfaction was occurring behind the scenes since no search for a successor was announced. This retirement comes one year after the retirement of the CFO. Polaris stock has declined by nearly 50% since 2015 and a look at the working capital items shows where problems arose. Polaris may have been too aggressive with dealer shipments leading into 2013 and has been forced to pare back dealer inventories on a massive scale. COO Bennett Morgan acknowledged the problem, stating “Elevated Polaris and industry dealer inventory levels, along with our commitment to further drive any dealer inventory lower, will result in reduced model year 2017 shipments.” On the bright side, $160 million of inventory was culled in 2015. There should be opportunities for a return to supply/demand equilibrium as dealers re-stock the showrooms. A grain of sand in my shoe is the treatment of the Taylor-Dunnacquisition for approximately $54 million in March 2016. The acquisition is described as “non-material.” This makes sense weighed against the $2.4 billion of Polaris assets. However, I find it interesting that the guidance for 2016 included some comments about sales declines in off-road vehicles being mildly offset by Taylor-Dunn revenues. If a $54 million acquisition is worth touting as a source of growth, a pro forma should have been provided in the 10-Q. You may disagree. If that’s the case, I will make another argument: For a company like Polaris that has hailed itself as an active lifestyle brand, an acquisition of a staid industrial transport company seems like a diversion. Management argues that the acquisition will smooth the notorious seasonality of Polaris sales. The very notion that an acquisition makes sense because it smoothes earnings is not exactly a ringing endorsement of the purchase. Investors also must be aware of the growing role of vehicle financing at PII. Income from financing has become a significant share of operating income. While the rise is not alarming, it does raise concerns about how much the company has artificially inflated sales through finance-based incentives. Sub-prime defaults in the auto sector have been flagged as a risk, so thoughts crossed my mind that Polaris my have some negative exposure if credit quality in the economy deteriorates. Indian and Victory Motorcycles have been star performers. I won’t dwell on this topic. Other authors have done a better job than I could exploring these exciting brand. Sales in the category were up by 18% year over year in the first quarter. Polaris has outstanding returns on capital. Even with the dismal 1st quarter sales numbers, Polaris will post pretax returns on capital above 50%. With $2.4 billion in assets and $463 million in debt, operating income is likely to be above $660 million in 2016. Net income will decline slightly to $430 million, or $6.50 per share. The P/E ratio at this level is 13. Meanwhile, free cash flow excluding changes in working capital should be above $330 million. This leaves plenty of room to pay the $139 million of annual dividends. About $190 million could be allocated to other acquisitions or a purchase of shares. This could juice earnings per share to $6.65. Polaris is also stronger than its peers. Alpha Investments already showed the comparison to Harley-Davidson (HOG), so I won’t dwell on it here. 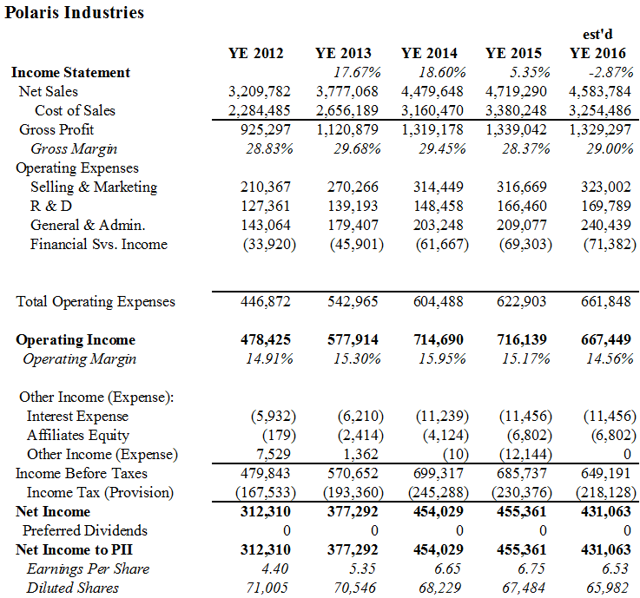 PII has much less debt and a pretax operating income “earnings yield” of 12.28% vs 8.92% for HOG. I also made a comparison to Yamaha (YAMHF). The yen conversion makes computations challenging. 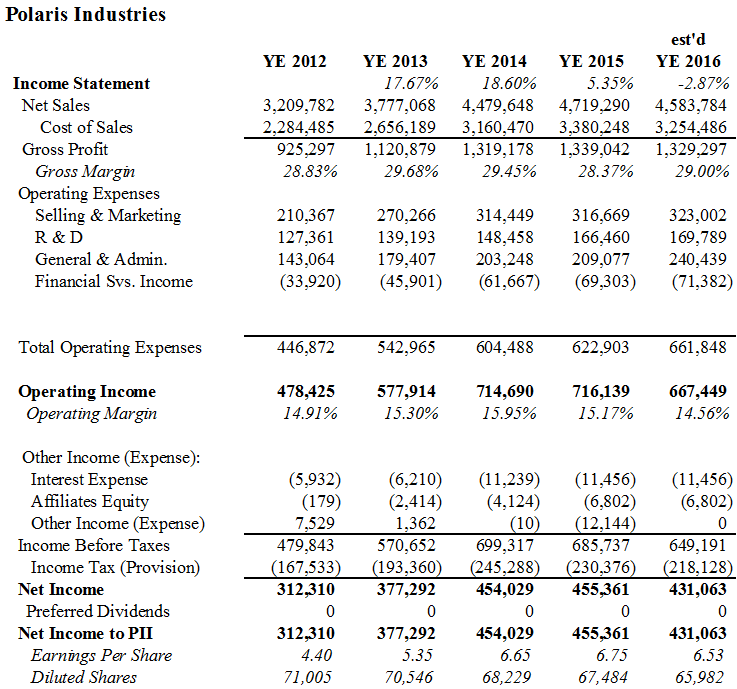 Yamaha does exhibit some good metrics: The company posts returns on capital of 16% and an operating income yield over 12%. I have attached my discounted cash flow analysis below. I welcome reader feedback on my assumptions. As per management guidance, I show sales declining in 2016 by nearly 3%. They begin to climb in 2017 and accelerate by 2019. This may be slightly conservative. Polaris invests heavily in R&D and capital expenditures that could lead to faster growth. I temper that with the belief that consumer spending and inflation in the US will continue to be mediocre at best. PII has very inexpensive debt, but a beta of 1.28 raises the cost of capital for the firm to about 9%. I showed capital expenditures increasing in line with sales growth. I predict pretax returns on capital to be above 29% based on an adjusted 2015 balance sheet that capitalizes R&D expenditures. As an aside, I find Polaris to be a refreshing change from other companies I have reviewed due to its omission of non-GAAP financials. Every company I have looked at falls over itself to release numbers based on EBITDA that excludes many items that should be included. It is a smoke-and-mirrors game that Polaris chooses not to play. For example, Polaris has a fairly sizable chunk of non-cash employee compensation, but it doesn’t omit that from its earnings guidance. I wish I could say the same for a majority of other companies. Could Polaris get snatched up by a foreign buyer? Polaris might make a good acquisition target at this level. The stock is at a mild discount (and a major discount from 2015), and a buyer could move some production to cheaper locales as well as deepen access to more international markets. businesses to add to the dollar assets while the renminbi faces possible declines. The FT recently ran an interesting story about the role Chinese car companies like Chery, Lifan, and JAC Motors have played in (now struggling) Brazil. It’s only a matter of time before these folks target US consumers. I am not going to purchase Polaris right now. I believe the company needs to post a few quarters of sales improvements and a resolution to its warranty issues before I go long. A safer choice may be the purchase of December $90 call options which hover around $6. For those of you who believe that a faster rebound in sales or a tender offer from a suitor lies just around the corner, call options could be a low cost way to play in the mud with Polaris.